We all wish to have a perfectly toned physique. A well-muscled physique with highly-defined muscular structure is truly every man’s dream. However at times, due to lack of working out at the gym for various reasons, we are not able to achieve this and it stays only a wish. Now, Cocoona Center for Aesthetic Transformation has made it possible for people in India to get toned and highly-defined physique using advanced cosmetic procedures, especially the VASER (Vibration Amplification of Sound Energy at Resonance) 4D Liposuction technique. Now, Cocoona Center for Aesthetic Transformation has made it possible for people in India to get toned and highly defined physique using advanced cosmetic procedures, especially the VASER (Vibration Amplification of Sound Energy at Resonance) 4D Liposuction technique. VASER 4D Liposuction is the most advanced in minimally invasive cosmetic liposuction techniques. VASER 4D Liposuction technique uses ultra-modern and sophisticated high-energy sound waves to melt the fat which makes it easier for removal through suction methods. The Vaser liposuction procedure is most useful for individuals who wish to give a toned and athletic look to their body. The advantageous 4D liposuction technique gives the best results with no risk of complications when preformed by the highly-trained and expert cosmetic specialists at Cocoona Center for Aesthetic Transformation. Am I an ideal candidate for 4D Liposuction? Any individual with realistic desired results in mind is considered to be an ideal candidate for the 4D liposuction procedure.4D Liposuction surgery aims to remove the stubborn and small pockets of fat, mainly from the abdomen, in order to give a sculpted and well-toned physique. 4D Liposuction procedure is purely a cosmetic procedure and aims only to remove the excess and small deposits of fat that remain even after thorough dieting and exercising regimen has been followed. This cosmetic procedure helps to enhance the underlying natural muscles and make your upper body muscular structure more noticeable and highly-defined. Both, men and women, are considered ideal candidates if they fulfill the criteria. How is the 4D Liposuction procedure performed? The advanced VASER 4D Liposuction is useful for providing a toned and highly-defined athletic physique for men and women.This 4D Liposuction cosmetic procedure requires the cosmetic specialists at Cocoona to administer local anesthesia to numb the surgical site. This prevents pain and discomfort during the procedure. 4D Liposuction is a sophisticated minimally invasive cosmetic surgical technique where the cosmetic surgeon will mark the main muscle groups on the upper body using a marker. 4D Liposuction procedure uses a small device (3 mm in width) which is set in a small tube. This device emits high-energy ultrasonic waves that are set at a specific frequency which helps to vibrate the fat cells and make them lose their adhesion towards each other gradually. This device in inserted gently using a small (2-4 mm) incision on the surgical site. The device emits the ultrasonic waves which help to liquefy the stubborn fat deposits. 4D Liposuction technique causes minimal-to- no damage to the surrounding soft tissues. The surgeon will then use a cannula (small suction tube) to gently remove the fat from the desired spot with ease as the fat is in the liquid state. The expert surgeons at Cocoona will slowly and carefully remove the underlying fat deposits that are in line with the natural contours of the body.This is also known as ‘Liposculpting’ or ‘Body Sculpting’ procedure. The contoured removal of fat helps to give the body a more natural physique and shape as well as enhancing and accentuating the muscles in a better way. 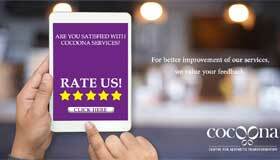 The expert cosmetic specialists and plastic surgeons at Cocoona are extensively-trained in performing this intricate procedure as it requires not only expertise but also an eye for detail. Is there a difference between High Definition Liposuction and VASER 4D High Definition Liposuction? High Definition Liposuction and VASER 4D High Definition Liposuction both this procedure aim to give a more toned physique and shape to the body but the main difference is that VASER 4D High Definition Liposuction technique allows to ‘sculpt’ the body shape through planned fat removal into a more defined and muscular physique. Which areas of the body are ideal for VASER 4D High Definition Liposuction? The VASER 4D High Definition Liposuction technique is useful in treating those parts of the body that are retainers of stubborn small fat deposits which are not remove even after dieting and exercising regularly. VASER 4D High Definition Liposuction technique is the most advanced and efficient high definition liposuction technique in the world and the cosmetic specialists and plastic surgeons at Cocoona are well-trained in performing this procedure to give you a well-defined and attractive athletic build.